The HSS is back and driving customers home for Christmas THOUSANDS of people will be driving home for Christmas with the Stena HSS Explorer as Ireland’s leading ferry company has announced the return of the Fastcraft for 12 days over the festive season. 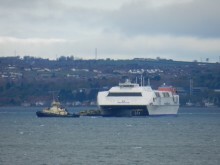 Stena Line’s HSS vessel, the Stena Voyager, which operated on the Belfast-Stranraer route between 1996 – 2011, is about to make her last journey as she heads to the recycling yard. AS part of Stena Line’s extensive Irish Sea fleet improvement programme, the Stena HSS Fastcraft seasonal service has returned earlier than anticipated on its Dun Laoghaire to Holyhead route, to ensure customers continue to have the best travel experience on the Irish Sea.